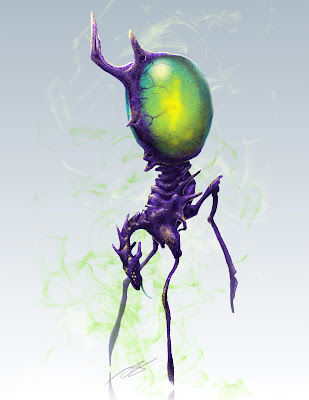 This creature lives on a gas giant with very low gravity. It has the ability to produce a gas that is lighter than the atmosphere and keep it in its chamber, giving it the ability to easily float around. The three skinny limbs cannot support the body since they are never used for walking, so they are only useful for picking apart the prey that it kills. It does this by snap-freezing the gas in its chamber to a very heavy substance making it drop out of the sky like a rock, and right onto smaller creatures leaving them stunned. Just another wacky round at the CGHub's "Creature Planets" activity.